Congenital absence of the lateral sesamoid bone is a relatively rare condition. Literature review reveals very few case presentations relevant to this condition. We present a case of lateral sesamoid aplasia that was incidentally detected upon roentgenograms of a patient presenting with a fracture to the base of the proximal phalanx. Figure 1 Radiograph showing medial, non-displaced, proximal phalangeal fracture. Aplasia or an absent fibular sesamoid is also seen. Figure 2 Axial sesasmoid radiograph reveals absent fibular sesamoid with a slightly visable ossified region central to the aplastic sesasmoid. The patient was questioned about any previous problems relating to his right foot. The patients other sport activity included basketball once or twice a week. He denies any injury to his right foot from this activity and has had no previous foot surgery. Physical examination of the right foot was considered as normal except of the signs associated with the proximal phalangeal fracture. It was decided that this variation had no bearing on functional loss or activity for the patient. He was placed in a short leg circular cast, non-weight bearing for 2 weeks. The cast was then removed and partial weight bearing was provided through soft shoes. Complete weight bearing was allowed at 4 weeks and sport activities was permitted at the end of 2 months. A 6-month follow-up of patient demonstrated that the lateral or fibular sesamoid aplasia, considering his younger age, did not adversely influence his attendance to sport activities before or after injury. 1. Brenner E, Gruber H, Fritsch H. Fetal Development of the first metatarsophalangeal joint complex with special reference to the intersesamoidal ridge. Ann Anat 184:481-487, 2002. 2. Brenner E. The intersesamoidal ridge of the first metatarsal bone: anatomical basics and clinical considerations. Surg Radiol Anat. May;25(2):127-131, 2003. 3. Conway WF, Hayes CW, Murphy WA. 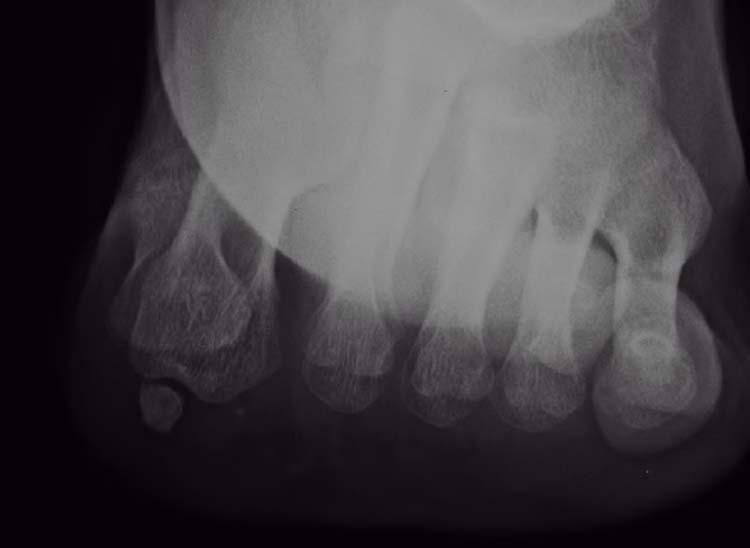 Total resorption of the lateral sesamoid secondary to Pseudomonas aeruginosa osteomyelitis. Skeletal Radiol 18:483-484,1989. 4. Coughlin MJ. Sesamoids and accessory bones of the foot. In Mann RA, Coughlin MJ (eds) Surgery of the Foot and Ankle, 7th Edition. Mosby, St Louis, vol. 1, pp.437-499, 1999. 5. Downey MS, Merritt SC, Sharrock-Maher CJ, Bernbach MR. Digital and Sesamoid Fractures. McGlamry’s Forefoot Surgery ,LWW, Philadelphia 559-573, 2004. 6. Goez J, De Lauro T. Congenital absence of the tibial sesamoid. J Am Podiatr Med Assoc 85:509-510,1995. 7. J.M. Le Minor. 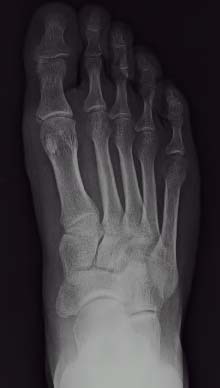 Congenital absence of the lateral metatarso-phalengeal sesamoid bone of the human hallux. Surg Radiol Anat. 21(3):225-227,1999. 8. Richardson EG: Hallucal sesamoid pain: causes and surgical treatment. J Am Acad Orthop Surg 7(4):270-278,1999. 9. Cardona,T., Kline, A. Surgical excision of painful fibular sesamoid. The Foot and Ankle Journal 1(8):2, 2008. 1Asistant Prof. , Department of Orthopaedics & Traumatology, Maltepe University, Istanbul. 2Department of Orthopaedics & Traumatology, Vakif Gureba Training and Research Hospital, Istanbul. 3Department of Orthopaedics & Traumatology, Vakif Gureba Training and Research Hospital, Istanbul. 4Prof., Department of Orthopaedics & Traumatology, Maltepe University, Istanbul.